It is art day here as I have been missing it. I thought I would head over to the best Charlotte Mason resource I know, www.AmblesideOnline.org and see what they had going on in their Art Schedules. One of the blessings of homeschooling is you don't have to follow anyone's schedules, but when you want to do so, they are there! 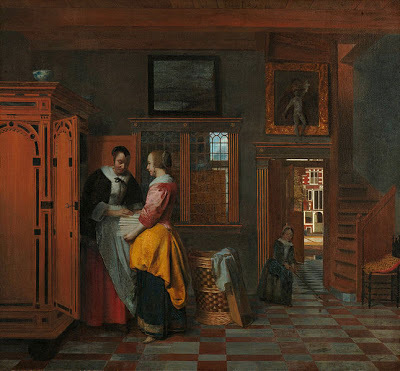 I had never seen Pieter de Hooch's art, but it is lovely and full of color and light. He was a contemporary of the Dutch Master Jan Vermeer, and you can see similar styles and certainly similar dress to his paintings. 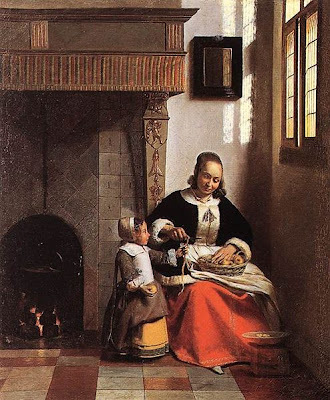 Pieter de Hooch's art is more delineated to me though - stronger lines and crisp. I like them both for different reasons! I think this is very clean looking - even with the broom on the ground. I remember reading that the Dutch always liked their cities clean and had a cleaning day where the whole city essentially cleaned the buildings and the ground. I don't know if that is true or not, but I thought it was a great idea! This has that post-cleaning feel to me a little bit. This has an almost religious feel to me. I can't exactly say why. Perhaps it is a mother/child thing, but anyway, I love the domesticity displayed here - and such a clean home! The lines and details on the fireplace and the clothing are very appealing to me. Here you see the light coming through the window. I love the shadow of the light on the wall. This is my very favorite of these three. I just love the deep rich colors and the fine detailed painting he showcases here. Do you see the bright sky through the window and the door? When you click on the close-up of the painting you see how much the artist uses white to highlight certain aspects that he wants to bring out. The light from the outside definitely draws the eye. I just love this one. Had you ever heard of Pieter de Hooch's art? What do you think? I sure wish I could paint like that! Britannica, National Gallery, London, or Wiki. I have never seen his art work before. I really like the first one. It's very crisp and clear. 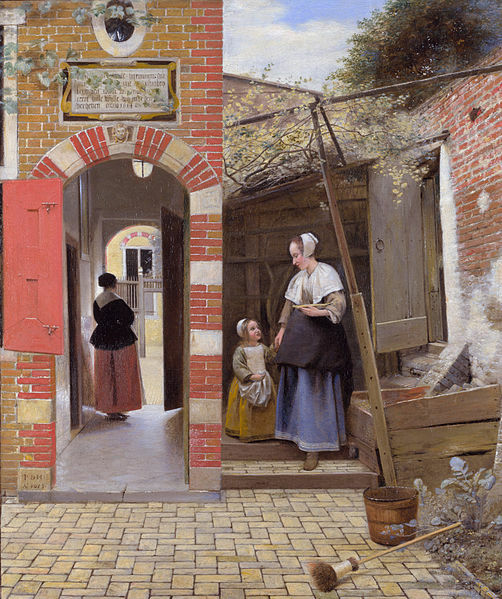 I love it that my favorite painting in England, The Courtyard, is also one of your favorites! I sure wish we could be in your art class but I am thankful for little moments that I get to hang around you.